Specialist Samuel Robert Bowen was born on September 6, 1965 in Salisbury, Maryland. He graduated from Stephen Decatur High School in 1983. He enlisted into the United States Army on April 8, 1987 and served on Active Duty until July 15, 1991. He was a qualified Food Service Specialist. On July 1, 2003, Specialist Bowen enlisted into the Ohio Army National Guard. He was a member of the 112th Engineer Battalion in Brook Park, Ohio before being transferred to HSC, 216TH Engineer Combat Battalion (Heavy) for deployment in support of Operation Iraqi Freedom. 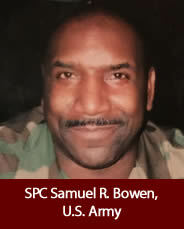 Specialist Bowen died as a result of wounds received in Ad Duluyah, Iraq on July 7, 2004. Specialist Bowen was providing security for other Soldiers who were repairing a disabled vehicle in an HSC 216TH Engineer Battalion combat logistics patrol, when Anti-Iraqi Forces fired a Rocket Propelled Grenade into his vehicle. Specialist Bowen received the Army Service Ribbon, National Defense Service Medal, and the Army Achievement Medal with 1 Oak Leaf Cluster. As a result of SPC Bowen’s service in Iraq, he received the Armed Forces Reserve Medal with “M” device, the Global War on Terrorism Expeditionary Medal, and the Global War on Terrorism Service Medal, the Army Good Conduct Medal, the Bronze Star Medal, and the Purple Heart with 1 Oak Leaf Cluster. Specialist Bowen is survived by his wife Melanie, sons Titus, Darius, Dartrell, and daughter Breonna. The loss of Specialist Bowen brings great sorrow to the 216th Engineer Battalion, the 112th Engineer Battalion, The Ohio Army National Guard, and the United States Army. He was a truly dedicated Soldier who will be missed by all who knew him and will never be forgotten.